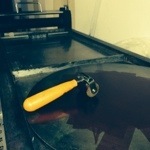 Redux Contemporary Art Center hosted a letterpress workshop with instructor Allison Nadeau of Ink Meets Paper. Students created holiday cards for the American Red Cross Holiday Mail for Heroes. Students ranged in age from middle school to high school and all connected in the name of art. Joshua Breland, the Volunteer Outreach Coordinator for Redux, and I even made our own card. Can’t wait until the next workshop in January!